Haiti has the highest maternal mortality ratio in the western hemisphere (670 maternal deaths/100,000 live births)—and UNFPA warns that this number will likely sky-rocket following the massive earthquake on Tuesday. “WHO is helping to collect data on the health impact of the earthquake and is also deploying a 12-member team comprising experts in mass casualty management, coordination of emergency health response and the management of dead bodies. For a list of organizations you can contribute to who are helping in Haiti, click here. 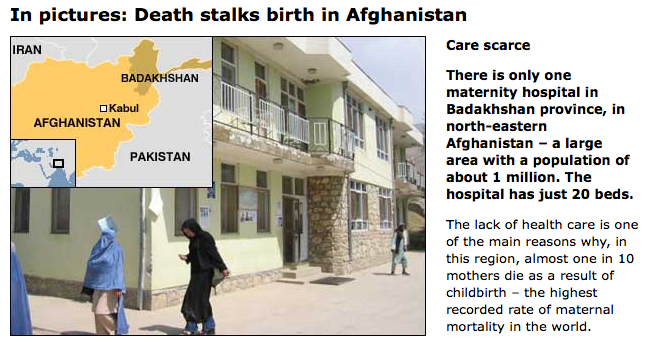 Take a look at this collection of photos and captions by BBC’s Andrew North that highlights several of the factors contributing to extremely high levels of maternal mortality in Afghanistan. Click here to see the entire collection of photos and captions.